There are a bewildering array of terms in economic development discussions about cities. Below we unpack them from a city perspective. The ‘smart specialisation’ approach combines industrial, educational and innovation policies to suggest that countries or regions identify and select a limited number of priority areas for knowledge-based investments, focusing on their strengths and comparative advantages. It builds on the Regional Innovation Strategies developed from 1994 onwards with support from the ERDF. Indeed the evolution is so close and deliberate that smart specialisation has been referred to as RIS 3. Evidence-based monitoring and evaluation systems to select the knowledge domains and innovation projects. Smart specialisation has been mostly applied at the regional level and will be a requirement for regions implementing operational programmes with the ERDF. This means in practice that there will be something like 350 versions of smart specialisation developed across Europe. Some will be deep approaches and some more a packaging of existing activities. The challenge for cities is to find a way to blend their own approach to innovation and local economic development with the notion of smart specialisation in their region. The region of Navarra has developed a fourth generation regional innovation strategy called Navarra Moderna. 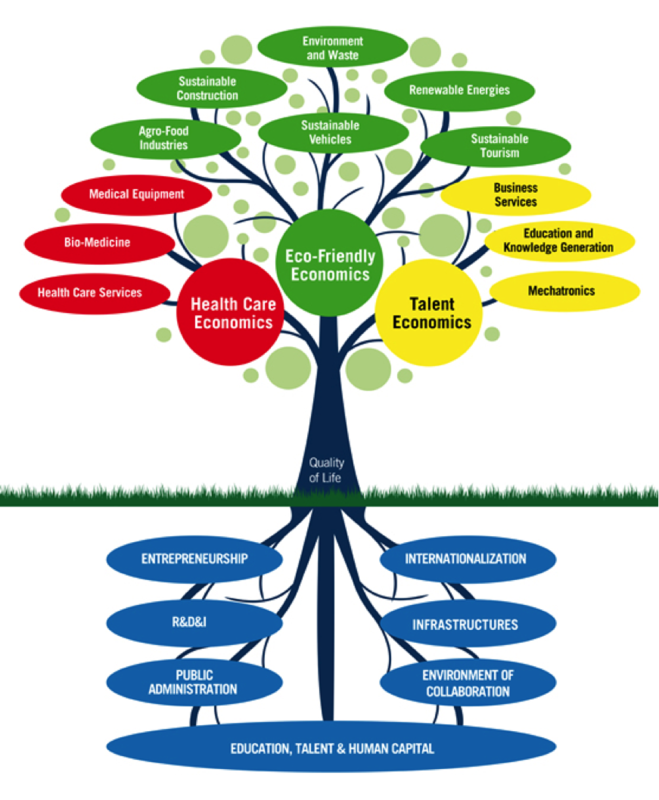 It focuses on three areas: health-care economics, eco-friendly economics and talent economics. Eindhoven in the North Brabant region of the Netherlands is a good example of a city that is doing nearly everything right by building a close relationship between city, the universities and research centres and the SMEs. The city’s Brainport development agency has driven the process since it was set up in 2006 and is controlled by a board comprising the triple helix partners. Eindhoven is also known for the ‘Open Innovation’ originally led by Phillips in a pioneering effort to change the way they did business by opening up their campus to other companies. Now similar methods are being used to revive sectors that have been in decline such as the motor industry. They combine open innovation with a triple helix approach, while it may seem to happen naturally in the Netherlands, which is really the product of years of partnership working in which partners are prepared to make compromises and work beyond their normal organisational context. For example, in their work with clusters, they put the private sector in the driving seat and expect financial contributions in return. This is a new way of working for public officials and requires a more flexible approach. The triple helix is a way of conceptualising the linkages between the research centres, the businesses and the city. This can involve new forms of collaboration and arms-length agency. These are seen in many parts of Europe. Seinäjoki in Finland set up a company to run its science park which also operates all of its incubation and transnational innovation programmes. Cities like Eindhoven, Rotterdam (lead partner of My Generation at Work) and Delft (lead partner of EUniversities) in the Netherlands have specialised in these triple helix approaches and in each case it is the city that takes a leading role working closely with the university and local industries. 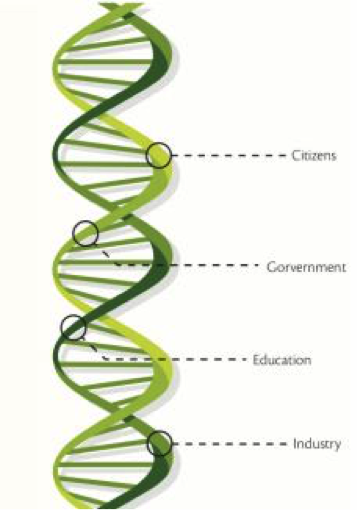 Now some of the more avant-garde triple helix advocates are moving towards a quadruple helix where the citizen or user is the fourth dimension. Jyväskylä took this approach in leading the Interreg funded CLIQ project and developed their own quadruple helix model with fifteen other European city partners. The quadruple helix takes technological innovation closer to social innovation where user-led innovation is a core methodology. Creating the right type of research to business interface is also about how the university facilities fit into the city in planning terms. The URBACT REDIS network led by Magdeburg looked at how the university can be brought into the city through a ‘knowledge hotspot’ approach. These are physical concentrations of knowledge-intensive or creative activity. They come in many guises: science parks, technology parks, creative districts, and design quarters. Well-known examples are the Cambridge Science Park, Barcelona’s @22 district, and Helsinki’s Arabianranta area. Increasingly, such hotspots are being developed inside the city rather than at suburban greenfield sites. This makes their development highly complex. A key challenge for cities is to deal with the many conflicting interests, and to integrate knowledge hubs in the city. How do European cities deal with these challenges? Which problems do they face, and how do they tackle them? The REDIS project brought together 8 cities that are developing knowledge hubs and seek ways to integrate them optimally in the city. Sometimes there seem to be nearly as many smart cities as there are urban areas. Smart cities have become the economic development fad of the decade. The smart city concept is being promoted by a wide range of organisations including the EU, large companies such as IBM and Cisco. Like any new concept, there are many definitions. At its most simple, a smart city has digital technologies across all of its functions. A more nuanced definition comes from Caragliu and Nijkamp: “A city can be defined as ‘smart’ when investments in human and social capital and traditional (transport) and modern (ICT) communication infrastructure fuel sustainable economic development and a high quality of life, with a wise management of natural resources, through participatory action and engagement.” This definition focuses not just on infrastructure and sensors but also places the citizen who acts and engages with the city through these new technologies. Cities like Helsinki have been pursuing smart city status by investments in real time information systems on transport, by methods of monitoring pollution and congestion and by big and open data approaches. Through open data they have unlocked more than 1,200 data bases by putting data online and thereby stimulating software developers in the city to develop new applications. Hack-at-homes competitions for app developers on a specific topic allow Helsinki to tap into the creativity of a community of developers and procure new smart applications that the clumsy public procurement system would never facilitate. Helsinki is concentrating all of its smart city approaches on one area of the city as a demonstrator of the new technologies while making them available throughout the urban area wherever possible. Caragliu, A., Del Bo, C. & Nijkamp, P. (2009), “Smart Cities in Europe”, Serie Research Memoranda 0048 (VU University Amsterdam, Faculty of Economics, Business Administration and Econometrics).